In the 1990s while working in parish ministry in a smaller rural church with limited funds, Pastors Joel and Wendy Berthelsen became weary of seeking ideas, trying programs and frantically recruiting the people to execute them in order to help a church thrive; as a result, they began contemplating their scriptural roots. In their “home church,” they had learned about the powerful scriptural concepts of God’s call and the multiplication of Jesus’ kingdom work through His Body, the church. As well, they witnessed the Holy Spirit pouring out His power and gifts upon all followers of Jesus in order to accomplish His call. So instead of making up ideas or finding programs, they began to teach, train and mobilize ordinary people in God’s call. Over time, though unpredictable, fruit for God’s kingdom began to emerge through the lives of ordinary people in the local congregation with little money and no prompting or planning. No matter the size of the congregation, fruit for Christ’s kingdom was evident because the focus was on helping individual people hear God’s call and then mobilizing these unique people for Christ Jesus’ kingdom. Being pastors within the Lutheran tradition, the Berthelsens also knew that Martin Luther also understood these crucial and powerful scriptural concepts, and taught about the importance of “call” or “vocation” to being the church. 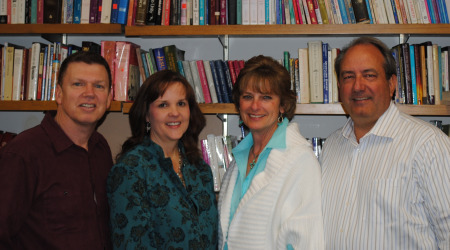 Later, the Berthelsens served as pastors in a church in Cedar Hill, TX where Steve and Kathy Harr were members. Prior to the formation of Call Inc., captivated and compelled by God’s call, Steve began speaking, teaching and sharing with others about God’s call in their own church gathering. Prompted by the Holy Spirit’s guidance, Call Inc. was birthed in December 2006 by the Harrs and Berthelsens to extend the scope of teaching about God’s call beyond their own church context. It is a faith venture that combines many years of study, concern and focus on how to help people understand that God is alive and active in their lives and highly desirous of a unique relationship made possible by the life death and resurrection of Christ Jesus that leads to a more complete understanding of His plans and desires for life. When Call Inc. began, the Harrs provided generously through their donations to fund the organization. Kathy served as the organization’s treasurer for many years and provided food at many of its events. In the beginning, the founders also served as the Board of Directors. Born in St. Paul Minnesota, she received a Bachelor of Arts in General Science from Gustavus Adolphus College and a Master of Arts and Master of Divinity from Luther Seminary. She is the president of Call Inc. and its primary teacher. She is the author of four books related to the living God’s call, and mobilizing people in God’s call. She also serves as a Lutheran pastor with over thirty years of broad parish and para-church ministry experience. Previously, she was a biomedical senior research engineer at Medtronic Inc. for eight years, receiving three U.S. patents. She and her husband Joel have been married for over 30 years and have four children. For several years, she was primarily a stay-at-home mom. Blessed by the Holy Spirit with the spiritual gifts of teaching, leadership and administration, Wendy has been preaching and teaching about Jesus and His call, His word and life with Him for nearly thirty years. Born in Grinnell, Iowa, he received a Bachelor of Science in Humanities from the University of Minnesota and a Master of Divinity from Luther Seminary. He is a Lutheran pastor with over thirty years of broad parish and para-church ministry experience. Prior to serving as a parish pastor, Joel was a part of a Christian musical ministry full-time for nearly four years. Wendy and Joel have two sons and two daughters. Joel is blessed by the Holy Spirit with the spiritual gifts of leadership, shepherding, teaching and encouragement. He is a gifted musician and composer. Born in Houston Texas, she received a Bachelor of Business Administration in Marketing from the University of Texas. Kathy was the first female regional manager of a Fortune Five Hundred company and active in the work force for 13 years. She left the work force to be a stay-at-home mom. She is the mother of two sons, and wife of Steve for more than 35 years. Kathy is blessed by the Holy Spirit with the spiritual gifts of leadership, administration and hospitality. She is actively involved in her church and community . Born in Roswell New Mexico, Steve received a Bachelor of Science in Education from Texas Tech University and Juris Doctor from Texas Tech University School of Law. He is the father of two sons, husband of Kathy for over 35 years. He is a founder of Munsch Hardt Kopf Harr P.C. law firm (now Munsch Hardt) with offices in Dallas, Austin and Houston Texas. Steve has been an active practicing lawyer for nearly forty years. He is now mostly retired. Steve is blessed by the Holy Spirit with the gifts of leadership, teaching and giving.